Diamond Bakery, home of the popular saloon pilot crackers, was founded in 1912. Diamond Bakery, preparing to mark its 82nd anniversary, has launched a contest dubbed "Search for the Ultimate Diamond," asking the public to submit their favorite stories and recipes for using saloon pilot crackers or other Diamond Bakery cookies or crackers. The closing of the Hilo Macaroni Factory in June left Diamond Bakery as the only local company still making the big round crackers known as "saloon pilots." These were descendant of hardtack, a nonperishable staple of 19th-century sailors' diets. But while hardtack was not particularly loved, saloon pilots are a beloved base for everything from cheese to fruit jellies. "Saloon pilot crackers are such an important part of our local culture, and in many ways tell the history of Hawaii," said Diamond Bakery President Brent Kunimoto. "We're really hoping people will dig into their family recipes and recall their best memories of our crackers." To enter, pick up an entry form at retail outlets where Diamond Bakery products are sold, or request one by e-mailing info@diamondbakery.com or writing the bakery at P.O. Box 17760, Honolulu, HI 96817. Then send recipes and stories with completed entry form to the P.O. box address. The deadline for entries is Dec. 15, and winners will be announced Dec. 31. Best memory will be judged on uniqueness/creativity, local appeal and the company's mission of sharing aloha with the rest of the world; the winner will receive a digital camera valued at $500. Best recipe will be judged on taste, ease of preparation, originality, creativity and use of local ingredients; the winner will receive a $500 kitchen shopping spree at the Executive Chef. Second-place winners in each category will win a year's supply of Diamond Bakery products. 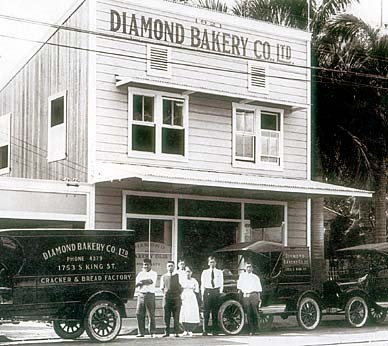 Diamond Bakery was founded on Oct. 12, 1921, by Japanese immigrants Hidegoro Murai and Kikutaro Hiruya, along with a friend, Natsu Muramoto. Six years later they hired baker Sam Dunphy, who took several years to develop the saloon pilot cracker that remains popular today.